In the last week of July, we had our first tour from company side for the year. We, all the employees of Sankalp Semiconductor Pvt Ltd located in Greater Noida, had a trip to the Golden City, Jaisalmer of Rajasthan. The city is located in the heart of the famous Indian desert, the Thar desert. The trip arrangements were done by a local resort "Rana Villa", starting from the pick-up from railway station till dropping us back. We started our journey in the Friday afternoon by the only train from Delhi to Jaisalmer. None of us is going to forget the train journey for coming few years, until something similar or worse happen again. Though we had our tickets booked in Sleeper class of the express train, we had to travel like in unreserved coaches, with each berth carrying more than 4 passengers and still people standing. This forced us to rebook our return tickets in the AC coach. Anyway, after 10PM, we got our seats back. The train reached Pokaran in the next morning and Jaisalmer around 11:30AM. Bus arrangement was already done to drop us in the hotel, to get fresh and have our lunch. The front side of almost all the houses and even the shops are decorated using the finely sculptured yellow sand stones. The road dividers are also decorated by the Jaisalmer District administration. We had our lunch and took rest in the hotel. In the afternoon, we went to the SAM Sand Dunes, the closest place in the Great Thar Desert. SAM has a truly magnificent stretch of sweeping dunes, with sparse or no vegetation. The best way to get here, of course, is on camel-back.There is no point coming to the Thar Desert, if you do not go for the Desert Safari and Camel Ride. All of us enjoyed the Camel ride for 2KM from one of the camel points to SAM Sand Dune. We enjoyed some time in the dunes with vocal music played by local boys, Rajasthani songs by local ladies, climbing the dunes up and down. Few of us also went for Camel Race and took pictures with local children. Unfortunately, we could not see the sunset in the desert due to the huge cloud covering the Sun. From the SAM dunes, we went to one of the near by resorts, where Rajasthani folk program and our dinner was arranged. There were folk songs, Rajasthani folk dances, drum-vs-kartal competition etc as part of the program. We enjoyed the evening in the program with snacks and cold drinks. Girls from our group also danced with the dancers at the end of the program. We had our dinner around 10PM. It was a typical Rajasthani dinner with Roti, Dal, Rice, Bhati, Choorma, Keshar and Pickle. We reached hotel around 11:30PM and took rest for the day. The next morning, we went to the Jaisalmer Fort, the Sonar Kella. Jaisalmer Fort is situated on Meru Hill and Named as Trikoot Garh. The massive yellow sand stone walls for the fort shows a typical color change from tawny lion color during the day to a magical honey-gold during the sunset. This fort is one among the few living forts in the country, with close to a quarter of the total population of the city living in it. The main attraction in the fort, other than the yellow sandstone buildings, are the Maharaja's Palace (Raj Mahal and Rani Mahal), the Jain temples, the Laxminath temple and the Shiv Temple. Few of us visited the Jain Temples. Most of the palace is made to museums. Due to lack of time we could not visit the museums. We had a view of the city from the fort and also took some picture from the view point. After the fort, we visited oldest havelis of the city, the Patwa Havelis. The havelis are ornamental marvels, where each stone is finely sculptured. Now these havelis are took over by the Govt of Rajasthan and made museums. We also bought some gift items from there and went back to the hotel for lunch. Post lunch, we visited the Gadsisar lake, the only source of water to the ancient Jaisalmer state. This lake is a rain water harvesting lake. Close the lake has the Folk Museum and a Shiv temple. One can have a clear view of the Jaisalmer fort from the Gadsisar lake view point. This concluded our Jaisalmer Trip, as we had to catch the return train at 5PM. 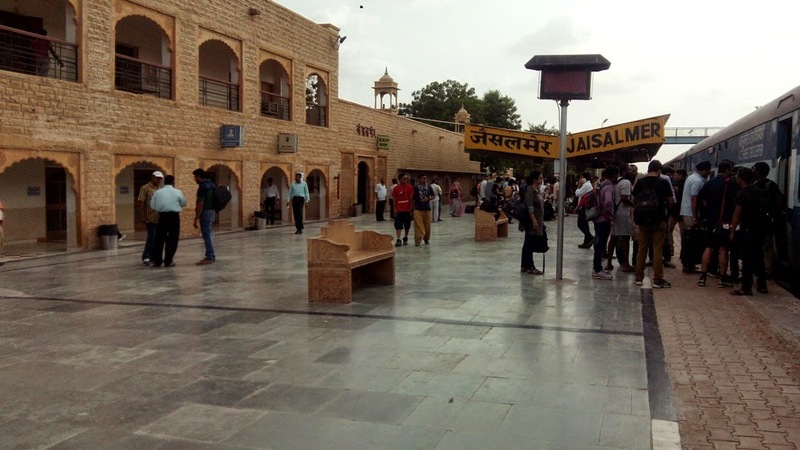 Though the trip of Jaisalmer concluded at the Jaisalmer Railway station, we had enough to entertain in the train; the memories, pictures taken, playing cards and finally dinner. On the way to Mathura, we visited the Gokul village. Gokul is the village, where Lord Krishna brought up by Nanda and Yashoda and performed few of His Balya Leelas. We spent some time in Gokul and reached Mathura by 5pm, as the temples open at that time. As we were getting late, we just visited the Krishna Janma Bhoomi temple only. We bought famous Mathura Peda and had Lassi there. 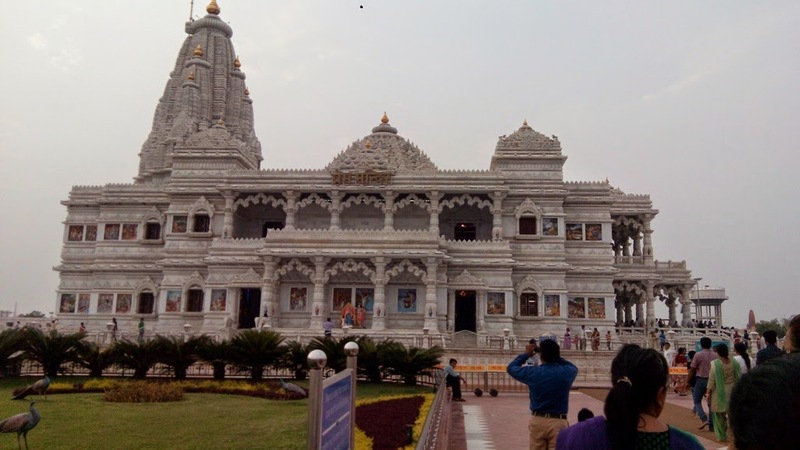 The last place in our agenda for the day was the Prem Mandir of Vrindaban. Though the temple is built recently, it was a nice place to visit. Various Krishna leela is described in various statues in the campus of Prem Mandir. The view of the temple in the night was beautiful with different lights giving it a complete different view in periodic manner. It was a really memorable trip of this summer. In the next morning, we enjoyed some quality time in the river bed in a cool weather. Few of us took bath in river Ganga again. 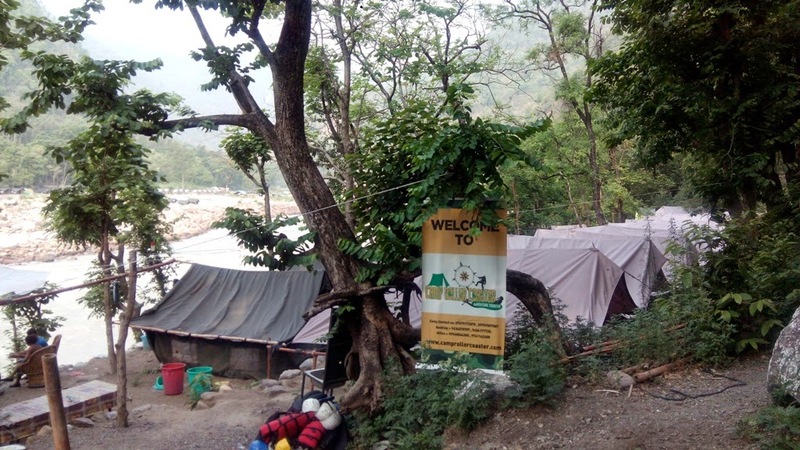 We checked out from the camp around 9AM and went to Rishikesh. We had our bus back to Delhi in the evening. Hence, we decided to visit few more places. We booked a cab and went to Haridwar. On our way, we went to Chandi Devi Temple. 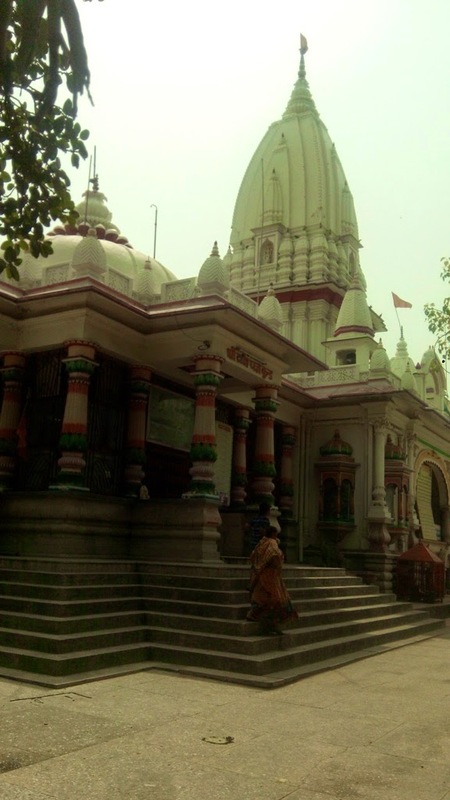 The temple is situated at the hill-top of Neel mountain, which was close to 3KM from the main road. 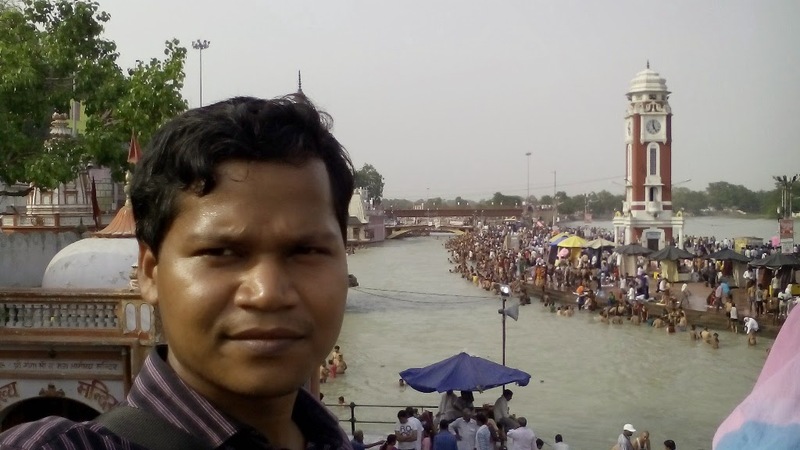 We could not visit the temple, due to lack of time and went straight Haridwar. 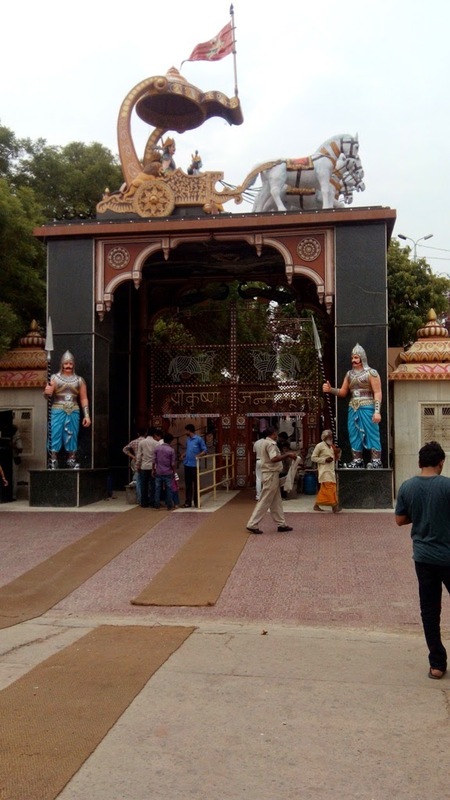 In Haridwar, we visited the Dakshya Temple, where the Dakshya Jagya Dedi exists. We had our lunch and went to the main place of Haridwar, the Har-ki-Pauri. 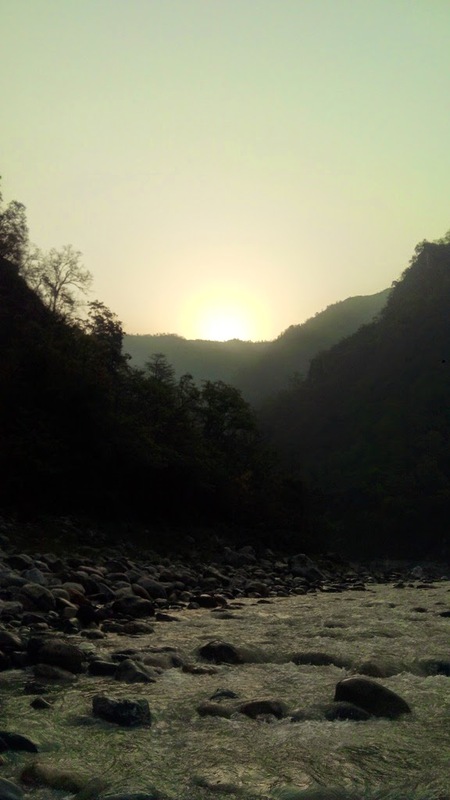 We spent some time there visiting the temples and went back to Rishikesh to catch the bus.